The earliest recorded name for Holy Isle was Inis Shroin, which is old Gaelic for 'Island of the Water Spirit'. After the time when the Celtic Christian saint St. Molaise lived on the island at the end of the 6th century, it became known as Eilean Molaise, which is Gaelic for 'Molaise's Island'. This name gradually evolved over the course of centuries until early in the 19th century the island became generally known as Holy Isle (or the Holy Isle) and the village on the other side of the bay became known as Lamlash. St. Molaise was born in Ireland, the son of Cairell, the Irish king of what is now called Ulster, and the Scottish princess Gemma. Molaise was a very gifted and spiritually inclined child. He was much loved by his own people and was offered the throne of Ulster when he came of age, but instead he chose a religious and secluded life in a cave on the west coast of Holy Isle. He was then only 20 years old. Some people believe that when St. Molaise chose the cave on Holy Isle as his hermitage, the island was already considered a special, "holy" place. When he was about 30 years old, Molaise went to Rome and was ordained as a priest by Pope Gregory the Great. When he returned, he entered the great monastery in Leighlin, Ireland which St. Gobban had established. Soon after he became its abbot. Under his guidance the monastery grew in fame and number to about 1500 monks. Molaise played an important part in adopting the controversial Roman method of dating Easter within Ireland. This was an important issue among the different Christian churches, who debated it for several centuries. When Molaise was in his late 50s, he went back to Rome and was consecrated first Bishop of Leighlin by Honorius I. Historians are divided on when Molaise died, estimating between 638 and 641. His feast day is celebrated both in Ireland and Scotland, on the 18th of April. The cave where St. Molaise lived, is about half way along the western shore of Holy Isle, about ten meters above the high-water mark, and consists of an overhanging sandstone rock with a sunken stone floor. It is thought that in Molaise's time much of the opening of the cave was closed up by a wall to keep the weather out. 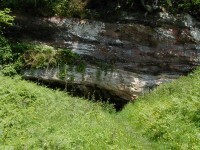 The cave can still be visited today. 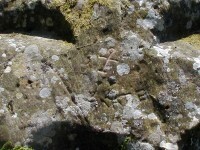 Carvings can be seen in the wall, such as simple crosses, perhaps made by pilgrims, and Norse runes, mainly of personal names. One of these says "Vigleikr the Marshall carved". Some of the crosses seem to have been carved at around the same time as the names, so perhaps there was an element of pilgrimage to the cave among the Vikings. Lastly, there is an unusually designed cross carved into the roof of the cave. Close to the cave is a spring, known as the Healing Well which is thought to cure ills and bring blessings. In the 18th century it was recorded that "the natives used to drink and bath in [the well] for all lingering ailments". The same source describes the water as "gushing out of a rock". At the beginning of the 20th century apparently there was a cistern present built of masonry, with a stone spout which delivered the water. The spring is overgrown now so that you wouldn't get more than a footbath from it but the water is still cold and clear, albeit it does not meet current EU standards for drinking water. There are several indications of a monastery having existed on Holy Isle, most probably close to what is now the Centre at the north end. It may have been erected at the beginning of the 13th century, although other sources say it was in the 14th century. The monastery buildings could have been made of wood or a dry-built structure which left no traces. In the 16th century it has been recorded to have decayed. In 1263 King Haakon of Norway brought a fleet of ships to the shelter of Lamlash Bay, before fighting the Scots at the Battle of Largs. Vigleikr, one of his marshals, went ashore at Holy Isle and cut runes with his name on the wall of St. Molaise's cave. After the battle, King Haakon gave the island of Arran to one of his supporters, but this really didn't count for much once the Norse had departed. In 1488 Holy Isle and land in the Lamlash area was owned by one John Hunter, before being passed over to the Earl of Arran in 1527. The island continued to be part of the Arran Estate in Hamilton ownership even into the 20th century, being rented out to various people until that time. In the 18th century, Captain James Hamilton (not related to the dukes of Hamilton who owned Arran) obtained a long lease on Holy Isle from the Duke of Hamilton. In 1779 he built what became known as the Big House (the old farmhouse, now called the Harmony Wing). In 1877 the inner lighthouse (facing Arran) was built on Holy Isle, engineered by David and Thomas Stevenson. It is locally known as "Wee Donald", though the current lighthouse keepers don't know why anymore. The outer lighthouse, or Pillar Rock, was built in 1905 on the east shore. It had a fog horn and a revolving light that was lit by paraffin. Pillar Rock lighthouse was the first lighthouse built with a square tower and has several rooms inside for the men who worked there. Lighthouse cottages were built to house four families of the lighthouse keepers and a walled garden was made. 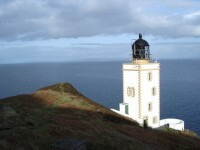 The lighthouses became automated in 1977, and are now serviced every two weeks by local people living on Arran. In 1957 the Duchess of Montrose died and the death duties were so high that the Arran Estate had to be divided. Part of the land was passed to the Forestry Commission and the National Trust, whilst other parts went into private hands. Holy Isle received a life tenant in 1958: Stewart Huston of Pennsylvania, USA. He was a millionaire who had a special interest in the island because he was descended from Gershom Stuart, who was Minister of Kilbride (at Lamlash) from 1747 - 1796. Despite his interest in the island and its history, he did not visit often, and the land continued to be used for grazing sheep by local shepherds from Arran. In 1968, the UFAW (Universities Federation for Animal Welfare) was asked to advise on the husbandry and management of the island's animals, which at that time consisted of Blackface sheep and a herd of feral goats. They set up a Field Study Centre in 1969, and after Stewart Huston passed away, they were able to buy the island in 1971. in later years they introduced 25 Soay sheep and 5 Highland cattle, and a few years later 5 Eriskay ponies. When the UFAW could no longer afford to keep it, the island had to be sold again. In April 1984, after having been on the market for 20 months, the island was bought by James and Catherine Morris for £120,000. They moved into the farmhouse the following summer with their two young sons. They managed to connect electricity from the south end to the north, which made living in the farmhouse much more comfortable for them. In 1990 all the Highland cattle and seven ponies were taken off the island, leaving the Saanen goats, the Soay sheep and five Eriskay ponies. In 1987 they decided to put the island up for sale for £1 million. The island remained unsold however, and in the autumn of 1990 Mrs Morris approached Lama Yeshe to offer the island to him, because she felt that its future would be best taken care of by "the Buddhists from Samye Ling". Lama Yeshe first came to Holy Isle on the winter solstice of that year and became determined to buy the island. Finally the asking price was dropped to £350,000, which Lama Yeshe managed to raise by April 1992.